Christians have faith in a God who wants to and is able to transform the world, conquering evil with good, Pope Francis said yesterday. Source: Crux. That is why “it makes sense to obey and abandon oneself” to God and his will, even during life’s most difficult moments, the Pope said during his general audience in St Peter’s Square. “God is not ambiguous,” Francis said. “He does not hide behind riddles” or inscrutable plans; he wants everyone to know the truth and be saved. Present at the general audience was Nobel Peace Prize recipient, Setsuko Thurlow, 87, a Japanese-Canadian survivor of the United States’ atomic bombing of Hiroshima in 1945. 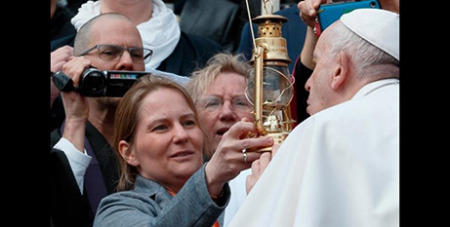 She was part of a delegation of activists who presented Francis with an oil lamp lit with a flame that was taken from the burning ashes of the bomb dropped on Hiroshima. The group asked Francis to blow out the flame they brought as a symbolic gesture of wishing for a world free of nuclear weapons and a brighter, more peaceful world.